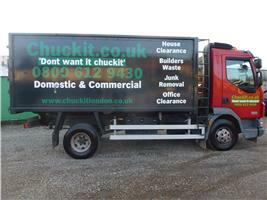 Welcome to Chuckit.co.uk friendly professional same day & on demand House & Flat Clearance - Furniture Disposal & rubbish removal service for all of London, Enfield, Essex & Hertfordshire. We are a fully licensed & insured house clearance & rubbish removal service, we specialise in all house & flat clearances including all completion date clearances & end of tenancy clearances or for homes going on the market, our friendly professional team will have your home emptied in time for your sale completion date or your end of tenancy date, we can dismantle any oversized furniture, empty and clear all storage cupboards, we bag up all loose junk as we go and remove all unwanted rubbish & junk from anywhere in the home including emptying cluttered lofts, garages, sheds to make sure the home is as empty as you want it. For all rubbish removals including all refurbishment waste clearance we cater for both domestic & commercial same day or on demand rubbish removal collection service, we clear & remove all household rubbish, old furniture, renovation builders waste & DIY stripped out waste, so if you have had a old bathroom or a kitchen stripped out to make room for a new one or have knocked a wall out to create some space, we arrive on site with up to a 4 skip lorry & team to load, you only pay for the amount of space required so it is very cost effective, and flexible, so if you have a few bags of builders rubbish or a pile of wood, or a old sofa, you can arrange a team to arrive with in a 2 hour window on your day of collection and get as much rubbish cleared as you require, we are a licensed waste carrier & insured, our friendly team will issue a waste transfer note on site once all cleared. Licensed & insured waste carrier. Same day & on demand clearances. Part & full property clearances. Same day or on demand service. Call 0800 612 9430 or 07939815649. You will always speak directly to me Stephen Desilva, i run a honest, reliable clearance service you can call for more advice and a free quote any time, we do all the loading and offer a same day service, no skip permits or parking suspension required, don't waste your money we park where skips can't, we will clear a few items to a full load you only pay for the space you require, all your waste is recycled and a waste transfer note is supplied on every collection. Chuckit.co.uk ltd.